The Lunar Library is an instance of The Billion Year Archive™ initiative, which aims to build a solar-system wide library system that can preserve, connect, and share humanity’s knowledge for billions of years. As part of the launch, the Arch Mission Foundation is revealing some of the contents of the the Lunar Library’s approximately 30 million pages of content. The Lunar Library is contained on a specially designed Arch™ Disc, which is actually comprised of 25 thin nickel films, created using a new technology called Nanofiche™, for the Arch Mission Foundation, by NanoArchival (http://www.nanoarchival.com). Nanofiche is a nanotechnology for storing data so that it can last for extremely long durations. It is made of pure nickel, which is impervious to radiation and temperatures on the Moon, and can last for billions of years without losing any data. Each layer of Nanofiche is created using a process called optical nanolithography, in which data is first etched to glass by laser at 300,000 dots per inch, and then grown at atomic scale in nickel using an electrodeposition process. Each layer is only 40 microns (0.04mm) thick and weighs only 4 grams. The entire 120mm diameter Arch Disc, of 25 layers of Nanofiche, weighs only 100 grams and is only 1mm in thickness once assembled, which is about the size and weight and thickness of a DVD. Although quite small, this artifact contains approximately 30 million pages of knowledge, making it one of the most information-dense objects humanity has ever made. The top 4 layers of the Lunar Library are encoded as analog images and comprise more than 60,000 pages at 200 dpi, viewable with 150X to 200X magnification optical microscope. This level of magnification has been available since the 1600’s. The Arch Mission Foundation chose to encode the top layers as low-magnification optical images so that potential future discoverers of the time capsule would be able to see and read content, without needing a computer. Included in the top 4 analog layers, is a special section called the Arch Mission Foundation Primer, which uses pictures and diagrams to teach what is on the discs, how to understand human languages and concepts, and how access and extract knowledge from the deeper layers. The deeper 21 layers contain 100GB of compressed digital archives in DVD format, which decompress to almost 200GB, comprising the bulk of the 30 million pages of the Lunar Library. 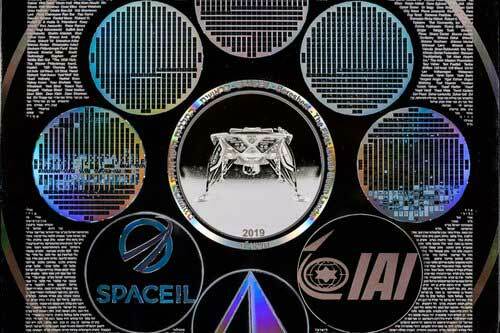 For delivery to the Moon on the SpaceIL Beresheet lander, The Lunar Library is encased in special materials to protect it during spaceflight. It is installed inside a special protective container that was made for it by SpaceIL, located inside the Beresheet lander, where it will be protected from the Lunar environment, and is estimated to last from 50 million to several billions years (depending on whether it is eventually hit by meteorites and how long the Moon lasts). The Arch Mission Foundation already has partnerships in place to carry future updates to the Lunar Library on the Moon, as well as missions underway to disseminate archives throughout the solar system, and to long-term underground locations around Earth. More information about these missions can be found at http://www.archmission.org/missions. The Lunar Library – Genesis Mission with SpaceIL was made possible by a grant from Tzili Charney and The Leon Charney Resolution Center, as well as support from Magical, PTScientists,The Slavin Family Foundation, The Sanso Trust, and Zambala. Partners who contributed content or assistance to the project include Genius 100, The Long Now Foundation, Archive.org, Project Gutenberg, NanoArchival, Wolfram Science, School of Information and Library Science at UNC Chapel Hill, Wikimedia Foundation, as well as a broad set of advisors, content contributors, and other organizations. More information about partners can be found at http://www.archmission.org/partners. Arch™ Libraries are the most durable records of human civilization ever built. Using new technologies, they preserve more knowledge for more time, than anything ever created. Arch™ Libraries are being designed in a variety of form factors to persist for long-durations on Earth, as well as in other locations across our solar system and beyond. advisors can be found at http://www.archmission.org/crew.